I've been trying out the 4/3 9-18 f4-5.6 lens on my new Panasonic GM5 camera, to perhaps carry it as a 2nd body on a trip to Utah (with my E-M10 plus 12-35 as main camera). Well gee, it is acceptably sharp in the center (the house number and lamp), but get even 1/3 away from it and it turns to murk, IMHO. I am very disappointed. I'm wondering if I am expecting too much from 9mm. It does improve if I zoom in some, but it seems to me that the WHOLE POINT of this lens is 9mm (I'm getting 12mm with my 12-35!, which is sharp as hell). It seems to me to be much sharper throughout. Of course, it is wider. What you lose, of course, is resolution after defishing and cropping. But the quality is much better, I think. So, my question - am I expecting too much from the 4/3 9-18 on an m43 body? Also, is a fisheye too radical for this type of use. I really do want my Utah pics to look natural! Last edited by RAH; 03-24-2016 at 07:10 AM. OK, don't everyone answer at once! I have to say, I'm surprised that no one here has any experience using a 4/3 9-18 on a m4/3 body. But anyway, I solved my problem by finding a used m4/3 9-18 lens in "excellent plus" condition on KEH website for only $449. And they gave me an additional 10% off (I don't know why; I'll take it! ), so it only cost me $405. What a deal! 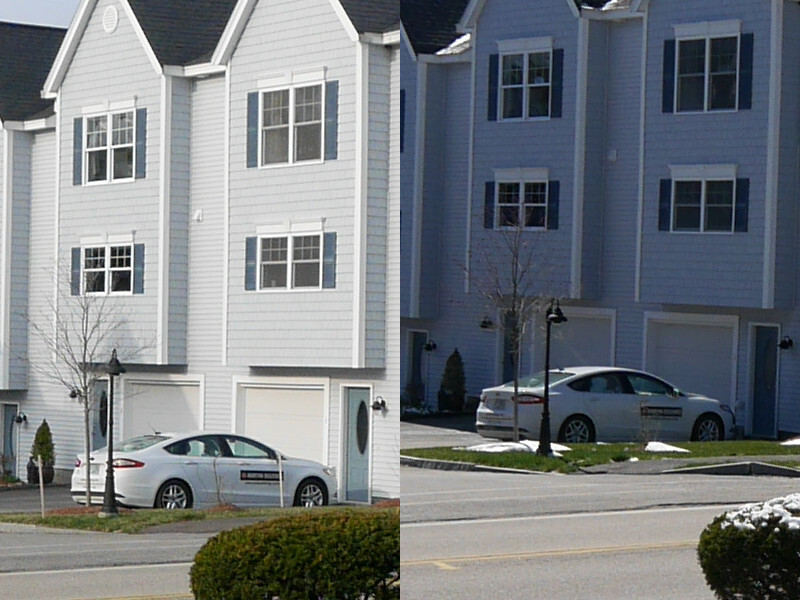 Not only is the m4/3 lens much smaller than the 4/3 (no surprise there) but the difference in image quality between them on a m4/3 body is astounding. They are both about equal in quality in sharpness in the center, but as you move toward the edge the 4/3 lens becomes fuzzier and fuzzier. I see some comments online that buying a used 4/3 9-18 is a cheap way of getting an ultra-wide for a m4/3 camera. Well, it's a terrible IQ way too, from my experience. I bought a used 9-18mm 4/3rds lens from keh.com, but I really haven't used it in real life testing (I should try it out, now that we are into 2nd spring, at least until 3rd winter comes back). My main use case for the lens will be this summer when I sometimes need to photograph a group of 9+ people in a small space. On my E-m5, focusing is rather slow. Unless I use it for video, I suspect I will probably want to use it on my E-5 rather than micro 4/3rds. I'll have to look into the image quality, but I recall back in the 4/3rds era, people liked it (assuming they couldn't afford the 7-14mm). Michael, yes I think you should test it before you are really using it. I almost just assumed that mine would work OK on my m4/3 cameras. So it was a rude surprise for me when I ran some tests. Glad I didn't find out while I was on my trip. I should mention that sure, I knew it would focus kind of slowly, but for an ultra-wide I didn't think it would matter much. The focusing was actually pretty good as such things go with an old lens on m4/3. Also, I always got good IQ from it on my E-520, so I do NOT think I have a bad 9-18 lens. Also, I have tried it on both my E-M10 and GM5 and the results are the same (poor). Someone suggested that my adapter (a Vello - B&H brand) might be at fault, but I don't see how because it has no optics (it isn't a speed-booster or anything like that). As long as it is giving good autofocus (proven by the sharp center) and good exposure values, it is doing its job properly, IMHO. Edit: It would be interesting to know the results of any tests you run. It doesn't matter for me now (since I bought the m4/3 9-18), but it might be helpful for others. I suppose it IS possible that I have a bad 4/3 lens - perhaps the "warm and fuzzies" are only at the extreme edge when used on my E-520 but move closer to the center on a m4/3 camera? The results are so poor that it is hard to belive I wouldn't have noticed them on my E-520 if they looked like that, but it would be interesting to see the results from someone else with a different copy of the lens. Last edited by RAH; 04-09-2016 at 05:09 AM. I can't remember for sure if I've used my 4/3 9-18 on the E-M1, but I'm pretty sure I have. I have yet to run into any issues with using any of my 4/3 lenses on the E-M1, including the Sigma lenses I have (Bigma, 105 and 150 macro, 18-50 2.8), and the Pan-Leica 25 1.4. I don't have the same bodies you do, so my experience may be different than yours. 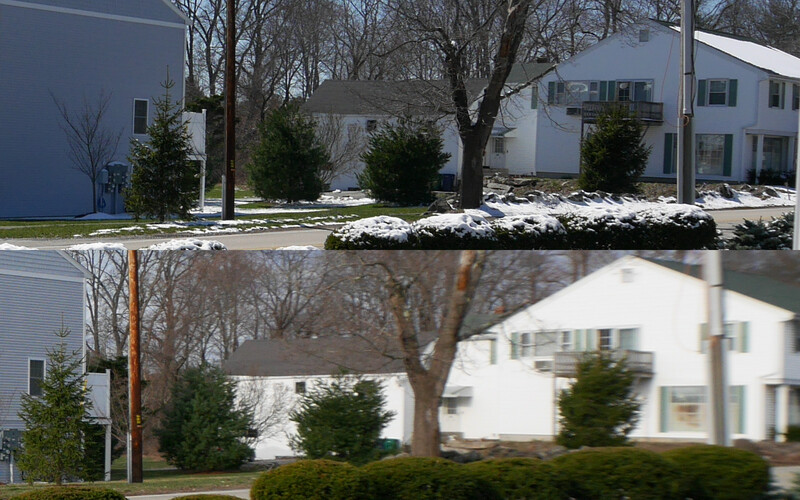 As you can see, the left side (which is getting toward the center of the original image) is about as sharp in both cases (kind of hard to judge with the different lighting). But as you go rightward, toward the right edge, the 4/3 lens quickly turns to pretty astounding murk. showing that the 4/3 lens (on the left) is actually a little sharper than the m4/3 (although again, the different lighting makes it hard to judge). So it isn't the focusing. I do find these results very surprising, and really do wonder if I have a bad 4/3 lens and just never noticed it before. That's awful! Have you tried it on your e-520? I don't use my 9-18 very often, but I just went and searched through my photos and it is quite sharp, however, this was on the e-3 - https://www.flickr.com/photos/geeman...n/photostream/. If I have a minute today I'll snap something with it on the E-M1 and post. Yeah, I guess the final step would be for me to test it with my E-520. I'll have to haul it out of the closet, charge the battery, etc. But it would be worth doing, just to try to figure out what is going on with this lens. It is indeed AWFUL! As you can see, they are pretty sharp from edge to edge, and certainly not what we are seeing with the same lens mounted on a m4/3 camera. Unfortunately, I am unable to do any more testing with my old E-520. When I charged the battery and tried to use it, it no longer works right. The Mode dial (where you set Aperture priority, etc) does not at all correspond to what the camera gives you - for example, I put it in Aperture mode and I get some stupid scenic mode, etc, with the lens staying resolutely at f4 (unless I zoomed in and then it showed the stopped down values for the various focal lengths). When it was in this state, I took some pictures (it focused OK), but when I checked the card there was nothing on it. So much for that. It broke while sitting in a drawer! Thinking that maybe the lens was at fault, I tried other 4/3 lenses (35mm macro; 14-54I, etc), and the camera stayed the same (weird and misbehaving) with all of them. Anyway, my earlier samples shows that the old 9-18 lens worked perfectly fine on the E-520 when I was using it, and looks like crap on a m4/3 body. I did try several more shots with the 4/3 9-18 on my E-M10 (just to have the same manufacturer - not the GM5); same poor results. Oh well. The m4/3 9-18 is very nice and will be perfect for my trip and later. I do hope that this disavows the idea of the 4/3 9-18 being a good poor man's ultra-wide for m4/3 (unless someone else can show some good results). A fascinating experiment. There is certainly something strange going on. I'm sure Olympus knows what is happening but with their characteristic reticence to interact with users, they aren't saying. Unfortunately, I don't have the 9-18mm, so I can't test it for you. I'm wondering if there is something off with this lens and the adapter, though, because it certainly looked good on the E-520. Is it possible that there's something in the lens wide open that just doesn't mesh with the adapter for some reason? So far I've used the adapter with my 50mm macro, 8mm fisheye, 50-200mm (old version), and 12-60mm. All of those worked out fine, albeit with "slow" focusing. (I have an E-M10 II.) The 50mm macro is the worst at doing...macros, because it hunts normally and even more so with the new camera. But I couldn't afford the OM-D E-M1, so I just photograph things that don't move with it. I'm glad you found a good deal on a micro 4/3 9-18. It seems like the smaller form factor will be much nicer on a trip, too. I agree, Kerry. I was REALLY happy about finding such a good deal on the m4/3 9-18 on KEH. They are hard to find used; I looked for at least 3 weeks (Adorama; B&H; Fred Miranda forum; this forum) before thinking about KEH. As you say, the lens is very small. Just about perfect. Actually, had I found the lens earlier I wouldn't have even bothered with the old lens - the small size of the m4/3 lens would have been enough for me to get it at that price. Concerning the 4/3 lens, I didn't use it wide open. I usually tested it at f8, sometimes f5.6. True, I was only trying it with 9mm (widest focal length), but I cannot think of any reason why it shouldn't work OK. If the focus were incorrect, or the exposure were incorrect, indicating poor communication between lens and camera (caused by adapter), that could easily be the problem. But both focus and exposure were fine (as shown by the sharp center and good exposure). Horrifically blurry edges, as seen, seems to just be a lens problem, I think. I did want to document this on a web forum, however, to at least warn people about it so they don't assume that the old lens will work for them. I almost went on my trip with the old lens without even testing it. I would have been sooooo unhappy when I got home and looked at my pictures! Yikes! (I have a tablet to check results on the road, but everything seems to look OK at that smaller size, for some reason). I don't have experience with the Panasonic bodies, but I am using all my ED 4/3 lenses on the E-M1 with very good results. So I really have the full choice now with the 4/3 ED's and the M4/3 lenses for my E-M1. I shot a wedding yesterday and took a few wide angle shots of the venue with my 9-18 and all images were acceptably sharp. I took a look at one that I shot at 9MM and f5.6 and everything that was in the focal plane seemed to be sharp. Your results are very curious. Have you contacted Olympus about this issue? I'm sorry, I should have updated this thread with more recent ideas, but it happened on another forum, so I was reluctant to post about it. Basically, the general agreement seems to be that my problem was in fact caused by the adapter (I am using a B&H Vello adapter). People are saying that it is because of mis-alignment - i.e. what someone called "out of plane." In other words, the plane of the adapter isn't exactly parallel to the lens - adapter isn't exactly flat vs the lens. I at first discounted this theory, but several later posts to the thread show samples EXACTLY like what I have been getting. One person towards the end of the thread absolutely pretty much proved the case because he had TERRIBLE samples using a cheapo adapter, then bought a Panasonic or Olympus adapter and it FIXED the problem. One mystery was that other 43 lenses seemed to work fine with my adapter - 14-54 and 35. But several people mentioned that they had seen this problem themselves - poor edge performance with an ultra-wide, but better performance with less-wide lenses. Even the 9-18 improves as you zoom in. So, it does make sense that if the adapter isn't seated properly vs the lens position, you would get poor results at the edges, and it seems likely that this would be worse as you got wider. If that link doesn't work, it has a topic of "Zuiko 9-18 vs M.Zuiko 9-18" and was started on 5/13/16. The section where I posted my complaints about the adapted 4/3 lens starts around 5/25. I wonder if he is seeing the same problem. Interesting. I have MMF-3 adapters for both my E-M1 bodies and have not had any issues with 4/3 lenses, and I have a large collection including some Sigma and Panasonic Leica 4/3 lenses. I am OK with buying some third party stuff (batteries for example), but usually stick with Olympus accessories for important things like battery grips, converters, etc. A flaky adapter is a good guess. You should not get any of the problems that the Sony people are reporting as the 4/3 lenses are designed for the same sensor size that µ-4/3 is using. The adapter just makes sure that you get the correct flange distance. Yes, but I was actually worried FOR the Sony folks - in other words, one of the potential problems with ANY adapter (including adapting to a different size sensor) seems to be not being exactly parallel to the plane of the lens, so even if they are having additional difficulties, they may the 4/3 - m4/3 problems added to it. I should think. Very interested thread, I still have some lens from the 4/3 format and I had bad experience using it with my OMD-E5 (manual focus of course). I think the way to go is with the new m4/3 lens but the price is a limitation. Even though I started this thread (so I obviously have had some trouble! ), I do see that MANY people have had good luck with adapting 4/3 format lenses onto m4/3 bodies. There are a lot of threads on this forum and others that give this impression (including good AF), so I wouldn't generalize too much about this. I am thinking now that the adapter itself is more important than I once thought (I'm talking about no-optics adapters, not speed boosters or the like). I do think that using Panasonic or Olympus adapters SHOULD give good results, but maybe it is sample-by-sample. Even the Vello adapter I use (that seemed to cause all my troubles with the 9-18) works fine with other lenses, including AF. But, as this thread shows, it can be problematic, for sure. I would first check to ensure that the screws on the camera, lens and adaptor mounting plates are tight. If you MF to get edge sharpness, is the centre OK? If so, then it might be a matter of tuning the AF to get edge sharpness.